In the first section of this Psalm (verses 1-6), David expresses his confidence in God's protection regardless of the kind of danger he confronts. He feels so confident and assured that even when his bitter enemies surround him on all sides, he exclaims, "From whom shall I fear?" (verse 1). There is nobody who can unnerve or intimidate him, due to his trust and confidence in God's ability to save him from harm. This section contains the famous verse of "Achat Sha'alti" (verse 4), in which David declares that his sole request from God is for the ability to "dwell in the house of God all the days of my life." As the Radak explains, although David felt joyous and grateful for the special protection God granted him from his enemies, he longed and yearned for the day when he would no longer be forced to wage battles against threatening armies, when his time and energies could be devoted to purely spiritual pursuits. God has thus far blessed David with miraculous victories and military success; the only thing for which he wished was a period of peace and tranquility that would allow him to spend his days in the "house of God," rather than on the battlefield. In the second half of this chapter (verses 7-14), David appeals to God for continued success against those who seek to destroy him. He observes that had it not been for his unwavering faith in God, he would have already fallen victim to the deceitful schemes of his adversaries (verses 12-13). It is only God's intervention that has allowed him to survive the assaults of his enemies thus far, and so he petitions God to continue affording him this special protection. In the Psalm's final verse, David turns to us, the readers and students of Tehillim, and admonishes us to follow his example of relying on God for assistance. And even if at first it appears that God has rejected our prayers, he instructs, we should continue praying and placing our trust in His power and compassion (see Rashi, verse 14). 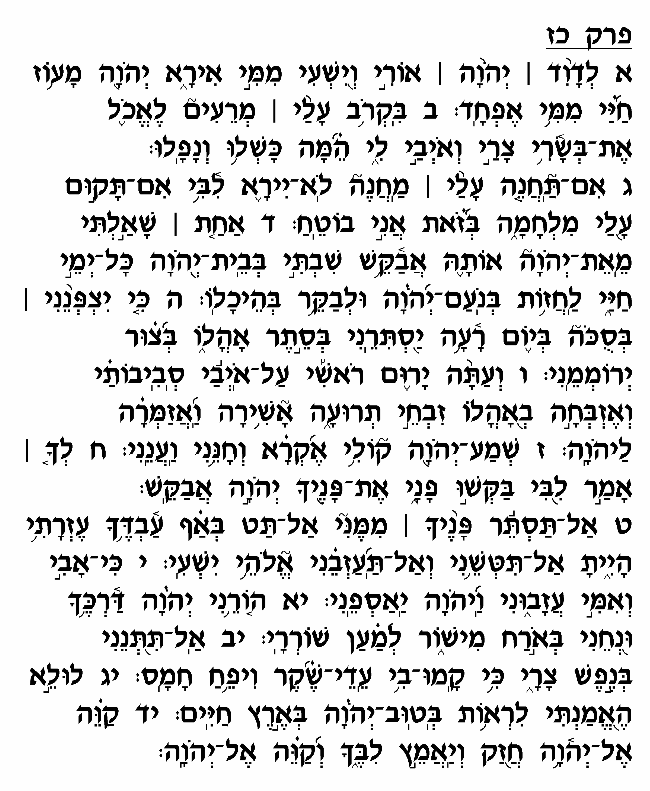 Some communities have the practice of reciting this Psalm each morning following the Shacharit service. The theme of confident trust in God's protection is an appropriate message to contemplate as one begins his day during which he must confront the hardships and challenges of life. Ashkenazic communities have the custom to recite this Psalm twice each day during the period of Rosh Chodesh Elul through Shemini Atzeret. The opening verse, in which David speaks of God as his "light" and "salvation," is understood as a reference to the compassion God displays during judgment on Rosh Hashanah and Yom Kippur. And, in verse 5, David describes God as offering him protection in a "Sukkah," a clear allusion to the festival of Sukkot. The custom thus developed to recite this Psalm during the season when these holidays are observed.